I would be willing to wager that if you asked a roomful of people to name fall holidays, the majority of answers would be Halloween and Thanksgiving. Correct, but... oh, those people. Those poor, misguided people. They're overlooking National Coffee Day! That's right, Sunday, September 29th is National Coffee Day and I, for one, am planning to celebrate. And, although my regular coffee has been making me happy day in and day out for quite a while now, this upcoming holiday is going to be anything but ordinary thanks to Gevalia. Because this year coffee has been given a major upgrade thanks to Gevalia releasing their revolutionary two-step single-serve café-style coffee beverages for Keurig K-Cup brewers. Already known for buying the best beans in the world and handcrafting a top-quality product, Gevalia offers over 40 premium coffees that have a distinctively rich, smooth taste that's never bitter and has been served by the Royal Court of Sweden for well over 100 years. 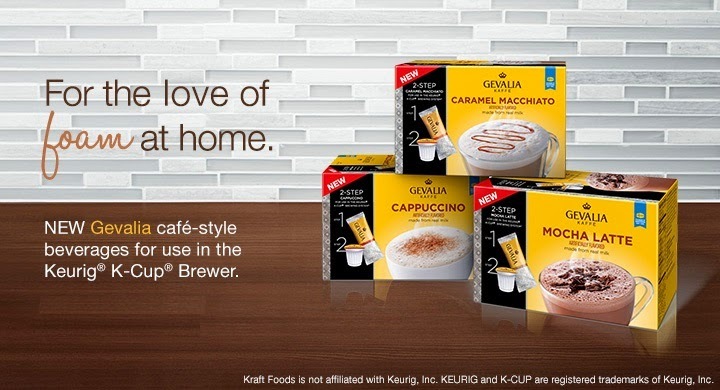 But these days Gevalia is not only upholding the uncompromising standards put forth by their founder back in 1853, they have taken coffee to an entirely new level with their new two-step, single-serve Keurig K-Cup coffee made from real milk. That's right, if you've ever dreamt of enjoying a latte made with real milk and topped with froth — all in the comfort of your own home — then now is the time to become a barista, my friend, with the new Cappuccino, Caramel Macchiato and Mocha Latte options from Gevalia. 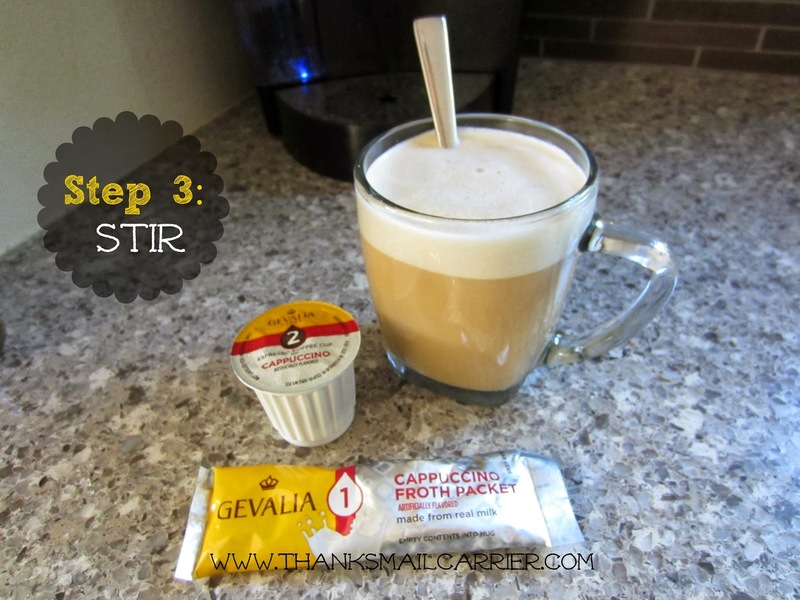 I couldn't wait to try each of these café-style beverages and I love that Gevalia made them possible without needing an espresso machine, a latte maker or the hassle and expense of a coffee shop. Instead, each one only takes two easy steps and, in under a minute, your drink is served. 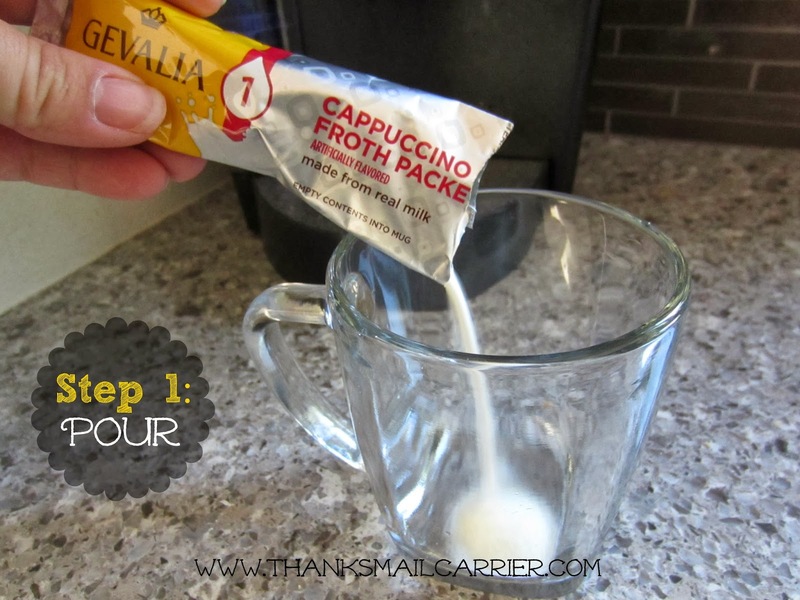 First, simply open and pour the froth packet (made from real milk!) into your mug. 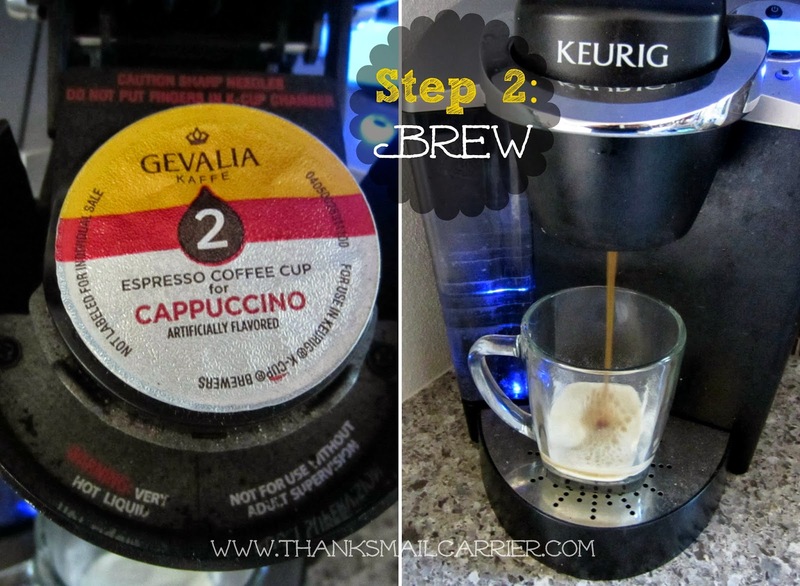 Second, place the coordinating Gevalia Espresso Roast single-serve k-cup in your Keurig and brew as usual. Third, take deep breaths of the amazing aroma while you stir and enjoy! You can't get much easier than that! No pots and pans, no frothing, no wasted time. Just pour, brew and drink. Each of the three varieties of Gevalia café-style beverages have ended up rich and delectable and I adore the way that I'm able to make them so quickly and easily whenever I want. Mocha Latte — A creamy, perfectly balanced blend of cocoa and coffee topped with a velvety layer of foam. Caramel Macchiato — Creamy and smooth, with the indulgent flavor of caramel, topped with a velvety layer of foam. Cappuccino — Smooth, mildly sweet with subtle roasted coffee notes, topped with a velvety layer of foam. Gevalia café-style beverages are available for purchase in six packs ($8.49 SRP) and nine packs ($11.99 SRP) at grocery, drug and mass retailers nationwide, as well as online at Gevalia.com. 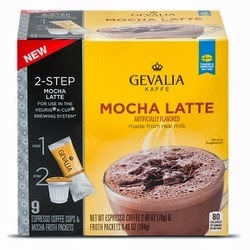 Be sure to visit FoamAtHome.Gevalia.com to find out more about these incredibly tasty new coffees, as well as signing up to receive a FREE sample of Gevalia Mocha Latte for yourself! 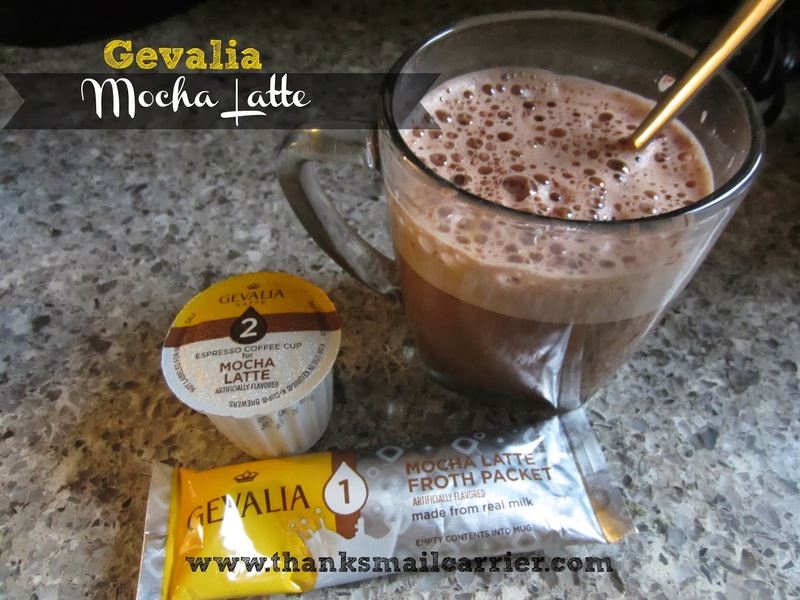 One lucky person will win a box of Gevalia Mocha Latte! 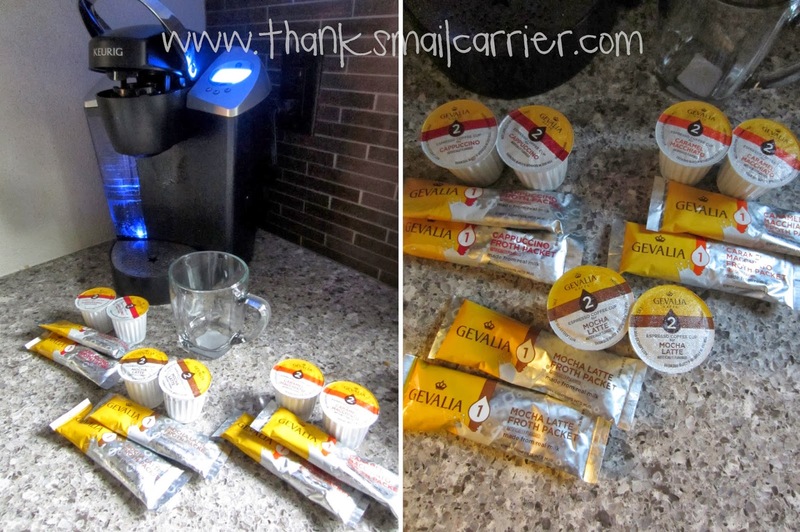 This post is brought to you by Gevalia Coffee from Kraft Foods and The Motherhood. I received a sample of Gevalia Coffee and I've been compensated for my time. All opinions are my own. I would like to try the Mocha Latte most. I would like to try the Cappuccino first. Thank you! Would like to try the Caramel Macchiato. I'd like to try the Mocha Latte. I'd like the try the Mocha Latte. That caramel macchiato looks good. I love it at Starbucks and I would love to make it at home. I love Mocha Latte!!!! It is a tough call but Mocha wins by nose. I love caramel everything! I'm sure the other flavors are nice too. The first one I would like to try is the Mocha Latte, although eventually I will try all of them. Love all coffee! I would try the mocha latte. I would like to try the caramel macchiato variety. First I'd try Caramel Macchiato. The mocha latte would probably be my favorite. I would love to try the Caramel Macchiato. i would like to try the caramel macchiato first and then the others! I would like to try the •Mocha Latte. I would try the Cappuccino! Thanks so much for the fantastic giveaway! I would love to try the Mocha. I'd like to try the Cappuccino. The Cappuccino looks good to me, but then they all do! I want to try the caramel machiato...it would save me a lot of money if it was good! I think that the Caramel Macchiato sounds really good! Caramel Macchiato sounds pretty yummy, huh? I'd like to try the Mocha Latte flavor. I would like to try the Cappuccino, mmmmmmmmmmmm. any flavor would be wonderful! I'd like to try the Caramel Macchiato for sure! I want to try the Mocha, I love Mocha!! I would like to try the Mocha Latte! coffee for fall would be nice. Would love to try the Caramel Macchiato! Yum! I want to try the caramel macchiato first. I think I'd try the caramel macchiato first. I'd like to try Caramel Macchiato first. I'd love to try cappuccino. I want to try the Caramel Macchiato! I'd like to try the Mocha Latte! I would have to say that Mocha Latte would be my fave. I would love to try the Mocha Latte. Thanks! Would love to try Mocha Latte. Id like the Mocha latte. The Caramel Macchiato sounds pretty good. Yum....I want to try the Caramel Macchiato first. I would first try the Cappuccino although they all sound good. 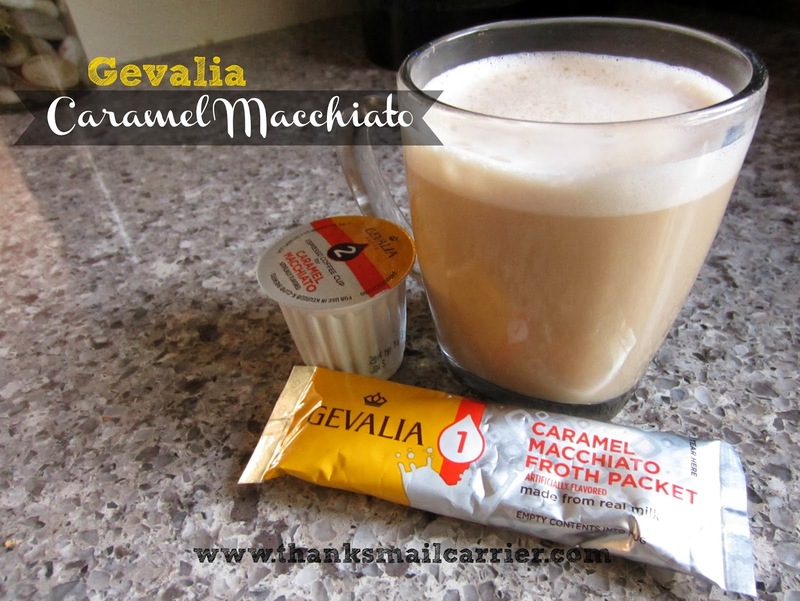 I'm a sucker for anything caramel, so I'd love to try Gevalia's Caramel Macchiato. Sounds so good! i would love to try the caramel macchiato! I would like to try the Caramel Macchiato first. mocha latte - I go nuts for mocha! I would love to try the Caramel Machiatto! It's my go-to flavor for all frappes and lattes! Yum. All sound delicious but I'd like to try the Caramel Macchiato first! I would definitely like to try the Mocha Latte! Yummy! Definitely the Mocha Latte-my favorite drink to treat myself to is a White Chocolate Mocha Latte! I would like to try the cappuccino. I'd have to try the Caramel Macchiato first. Anything with caramel in it gets my vote! The Mocha Latte sounds yummo! I would like to try the Mocha Latte. I want to try the Caramel Macchiato first! I would like to try the Caramel Macchiato the most! I would love to try the Caramel Macchiato flavor first! Caramel Macchiato would be my first one to try. Caramel Macchiato and then the cappuccino. I would like to try Mocha Latte! I would like to try the Caramel Macchiato first because it is my favorite coffee drink! I would most like to try the Caramel Macchiato. I would love to try the Caramel Macchiato first. Cappuccino. This looks like a great morning coffee! I would like to try the Caramel Macchiato. I would love to try them all but caramel macchiato sounds divine! The Caramel Macchiato sounds good. I'd try the Mocha Latte. I would love to try mocha latte! Cappucino would be my first choice. But I would love to sample all the flavors. I'd try the Mocha first! The Caramel Macchiato sounds delish! I'd like to try the Mocha Latte first. Caramel Macchiato is the one I'd love to try....it sounds decadent! I'd like to try Mocha Latte please! I would like to try the Mocha Latte. Yum! I would try the caramel macchiato first! I would like to try the Suchard Hot Chocolate too! I think the mocha latte sounds the best. Thanks for hosting! I would like to try the Mocha Latte first. The Mocha Latte sounds the best to me. I'd like to try it first. I'd like to try the Caramel Macchiato. I want to try the Mocha Latte. I really like Caramel Macchiato, my favorite! Where Dreams Come True: Walt Disney World!